321Soft Screen Video Recorder supports actions of starting, stopping, and pausing/resuming by hotkeys. 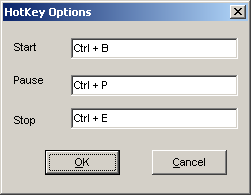 The default hotkeys are "CTRL+B", "CTRL+S", and "CTRL+P". You may also change them according to your habit. You need only set focus to the text box, then press the key you want, the key will be shown in the text box, then you may click "OK" button to save and return.